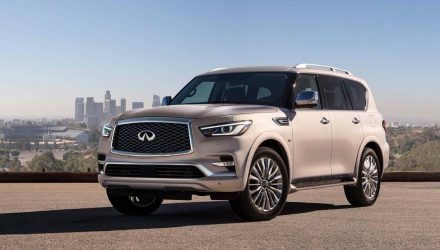 If, above all else, you want the largest 7-seat SUV on the market, the new 2018 Infiniti QX80 has to be on your shortlist. 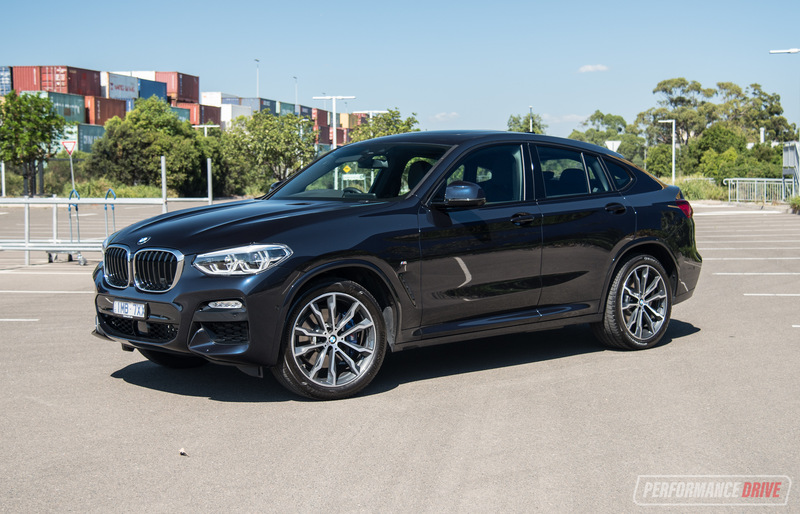 It offers one the largest cabins on the passenger vehicle market, and it also happens to be quite a powerful and luxurious beast. 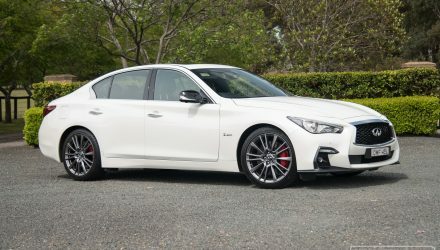 The Nissan-owned luxury car brand is still around in Australia following its market launch in 2013. 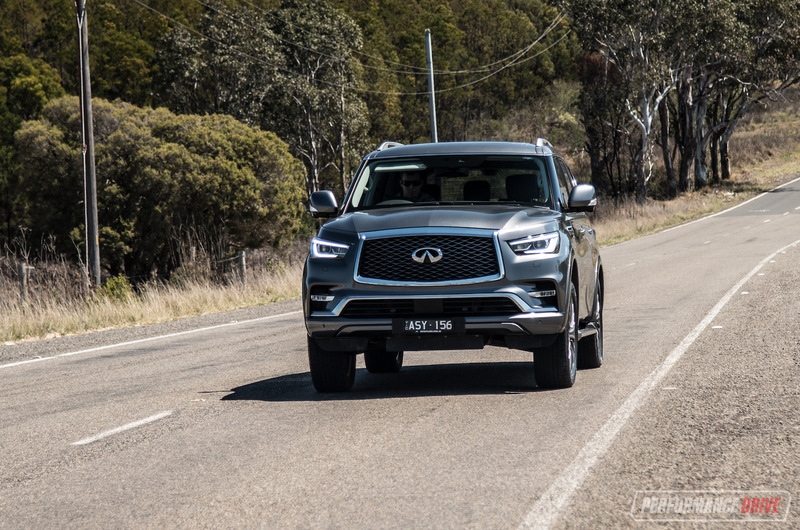 In Australia there are currently six main model lines available, spanning from the Q30/QX30, Q50, and up to the mack daddy of them all, this QX80. Sales for the brand aren’t exactly setting the market on fire, and so far this year (through October) figures are down 17.9 per cent. However, its year-to-date figure in October 2017 was up 2.1 per cent, and up 45.3 per cent in October 2016 (YTD). There is a dealer network here, with bespoke showrooms set up in most large cities. 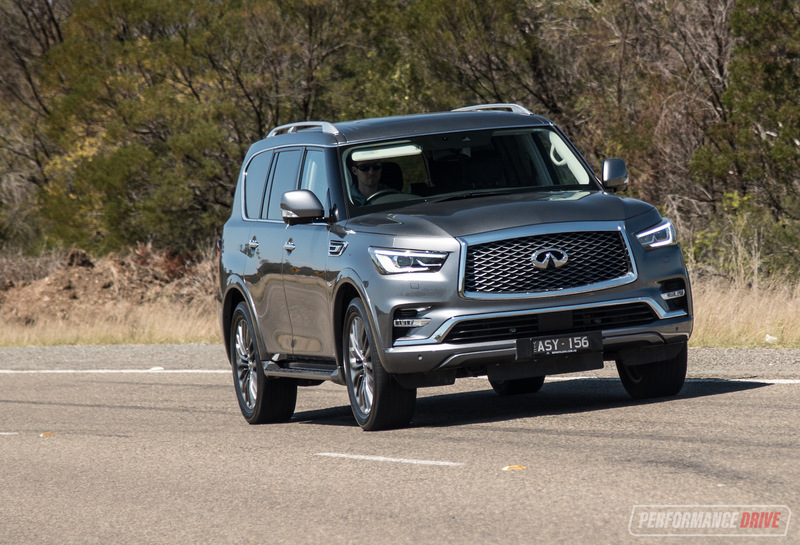 Infiniti has, thankfully, given the QX80 a digestible design facelift for 2018. The headlights are brought forward and lifted up, and the bonnet line is raised 20mm so the front end features a level profile. In short, it no longer looks like a crosseyed cartoon caricature of a rhinoceros. It looks neat and tidy, yet very imposing and important. It’s hard to believe that, underneath it all, is the chassis and running gear of a Nissan Y62 Patrol. 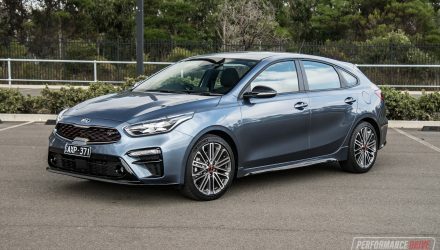 Compared with the previous model, prices haven’t budged. In 2015 the QX80 was priced from $110,900. Today, even with the facelift and some new technologies introduced, the starting price remains exactly the same. 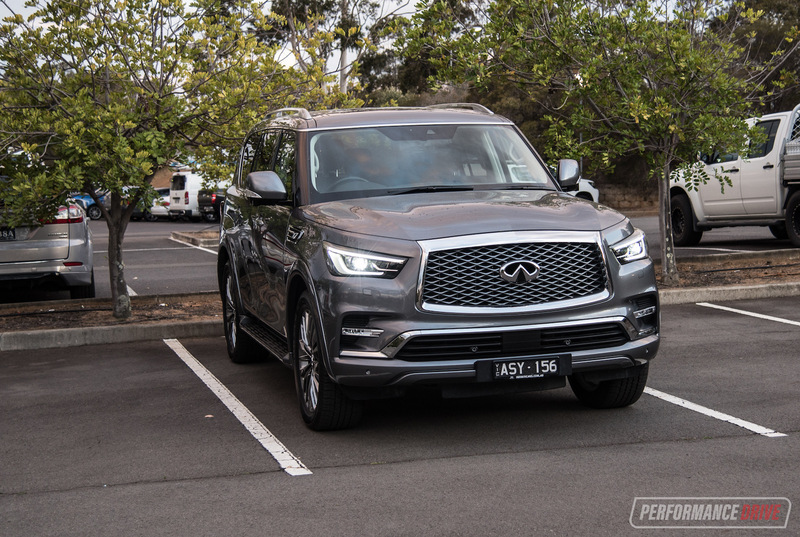 The QX80 is massive. It really has to be seen or experienced to be believed. 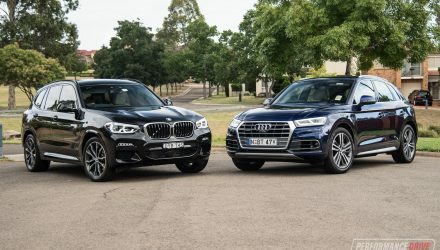 Yes, the Toyota LandCruiser and the rivalling Lexus LX are very big as well. 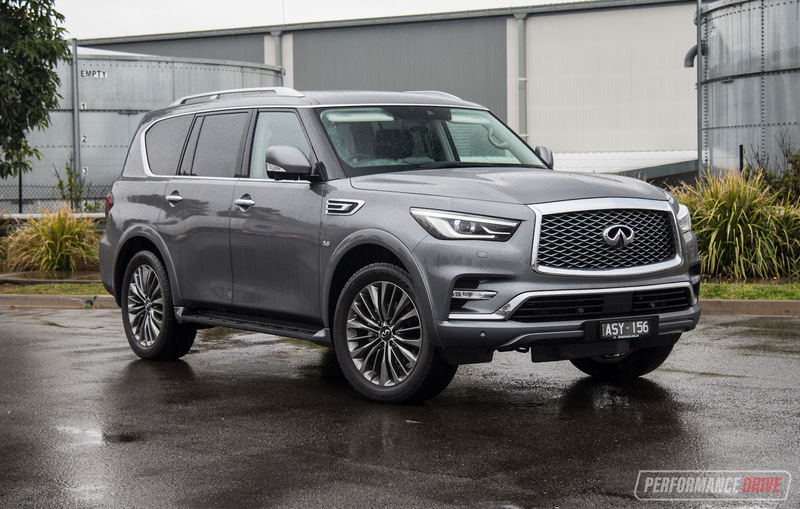 But the QX80 is even bigger. The length is measured at 5340mm, for Pete’s sake. That’s almost 300mm longer than the Lexus LX (5080mm). It’s also 1945mm tall compared with 1865mm of the Lexus LX. 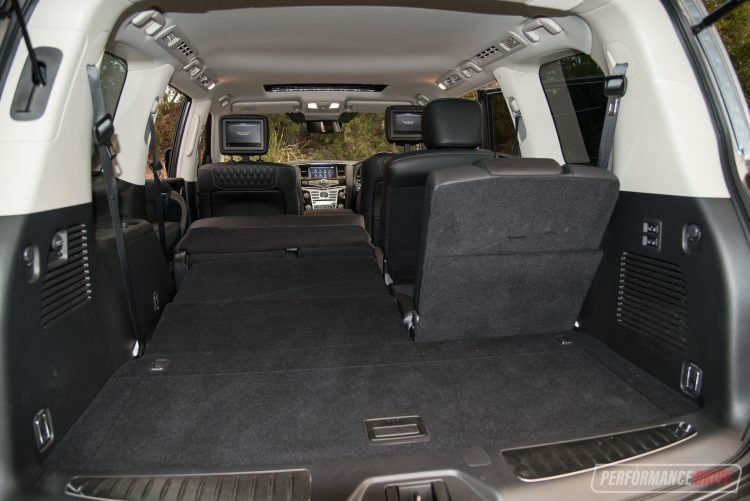 This makes it one of the largest SUVs on the market, outright. As you can probably imagine, it also makes it one of the trickiest to park in tight, underground car parks. In fact, some multi-story car parks are restricted to vehicles no more than 1.9m in height. This is definitely something you need to consider if you live a confined, inner-city lifestyle. For everyone else, you can enjoy the vast expanse of cabin and just relax. Infiniti has extended the side steps for 2018 so it’s easier to get in and out, although it still is a climb. Once you’re perched up on the big, soft, leather-clad chairs in the front, now featuring a “soil-resistant coating”, it can be difficult to find the motivation to get out. It is such an empowering experience up here. Most of the dash design and controls are carried over from the previous model, which, if we’re honest, was already a bit dated when it launched in 2013. 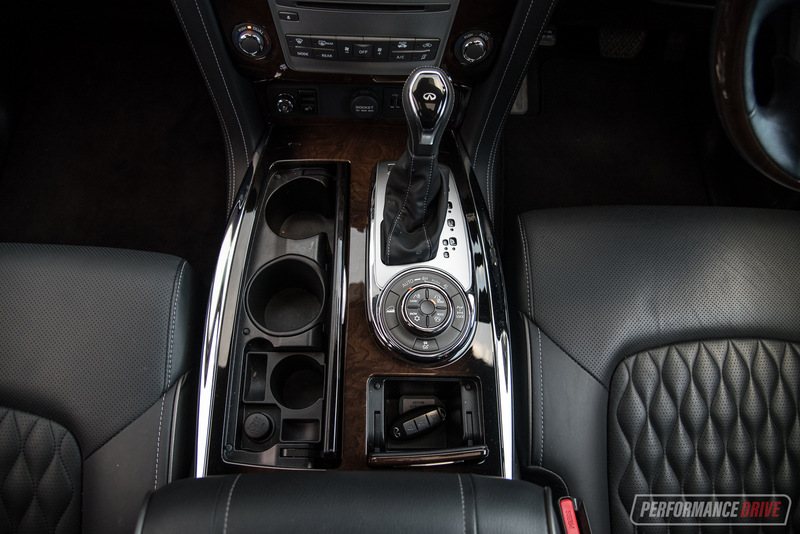 There’s lot of chrome and 1990s-inspired woodgrain trim. 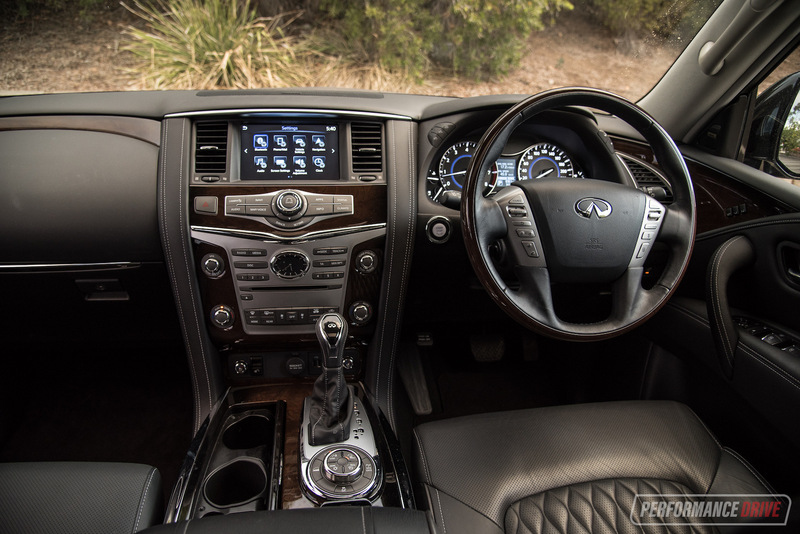 But as Infiniti says, the trim does offer an “old-school charm” for the interior setting. 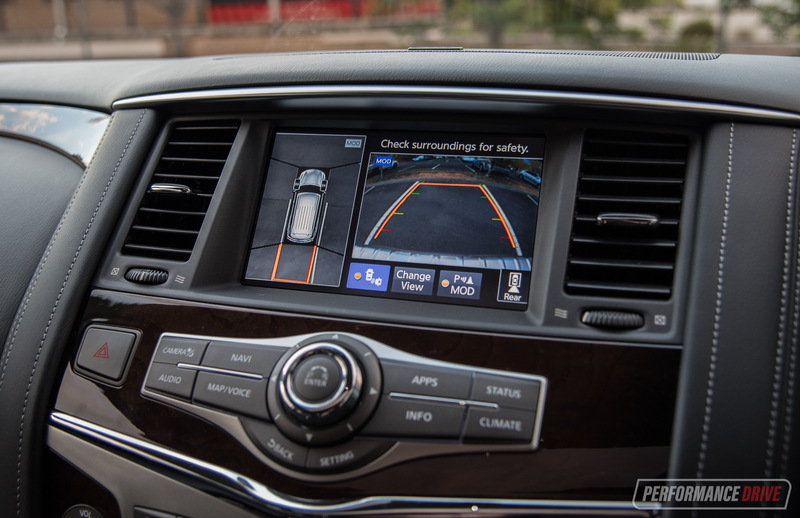 The sheer number of buttons and controls can be exciting, but this is also a sign of its age as most modern vehicles go for a minimalist approach and incorporate as much as possible into the main touch-screen interface. It’s a good thing that everything isn’t jammed into the touch-screen here though, as that too is a bit behind par. 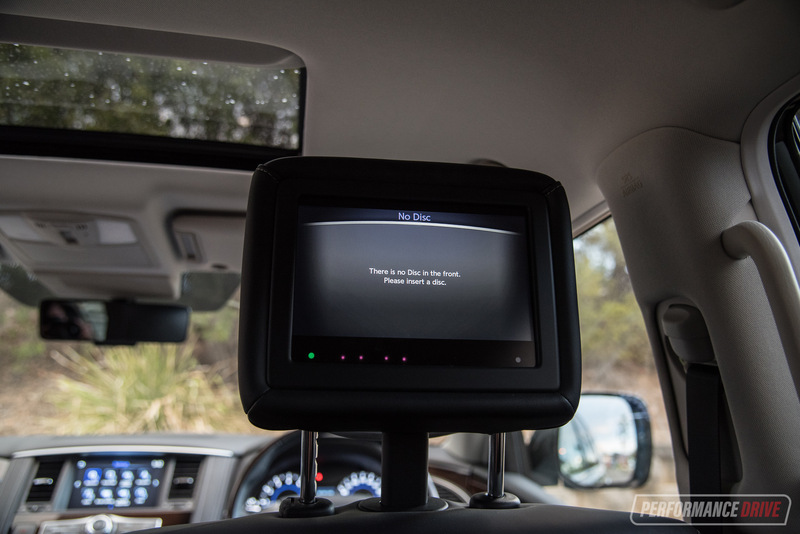 The 8.0-inch touch-screen lacks in size for this caliber of vehicle, and the WVGA (Standard Definition) graphics and touch operation are pretty poor. 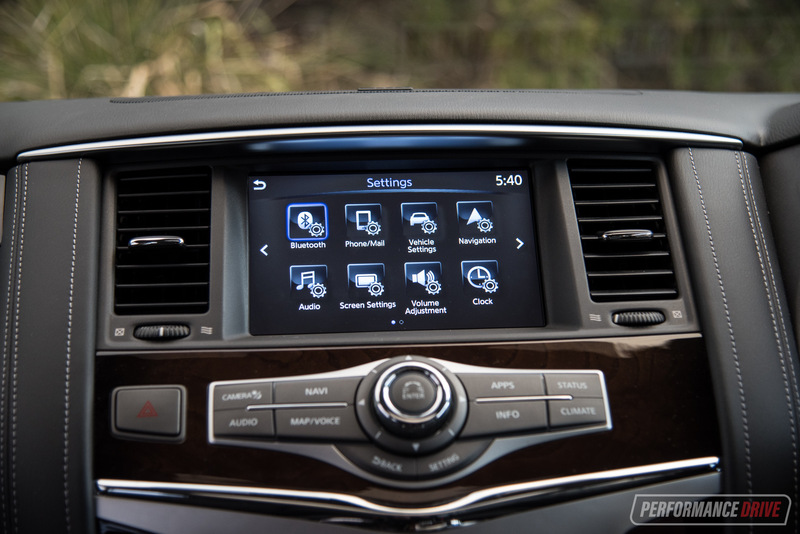 You won’t find Apple CarPlay or Android Auto, either. However, some redemption can be found in the back. 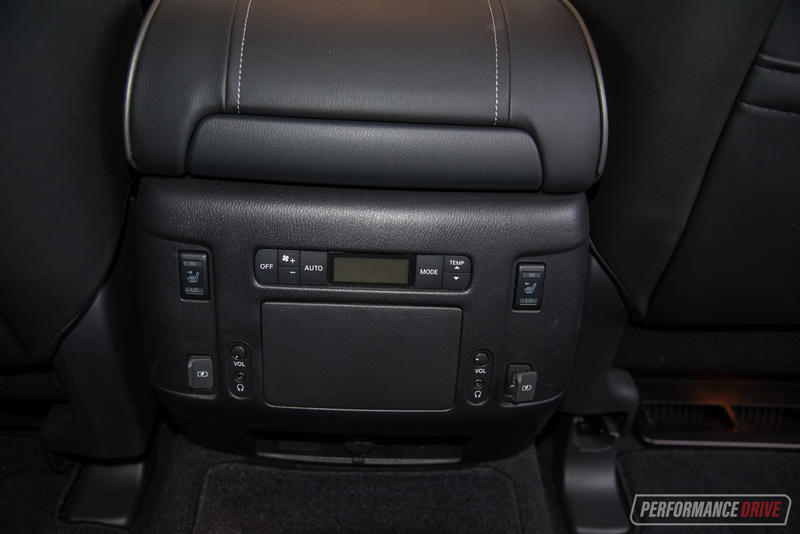 There are two 8.0-inch viewing screens in the backs of the front seat headrests (up from 7.0 inches in the previous model). These aren’t HD either but they offer 960 resolution and come with their own headphones and media control. Everything about this vehicle is big. 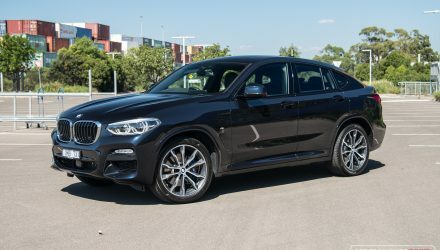 The front cup holders are capable of facilitating two 1.3L cups with handles, and the centre console storage box has been revised so that it can now hold three upright 1L bottles – or 5.4L in total storage. 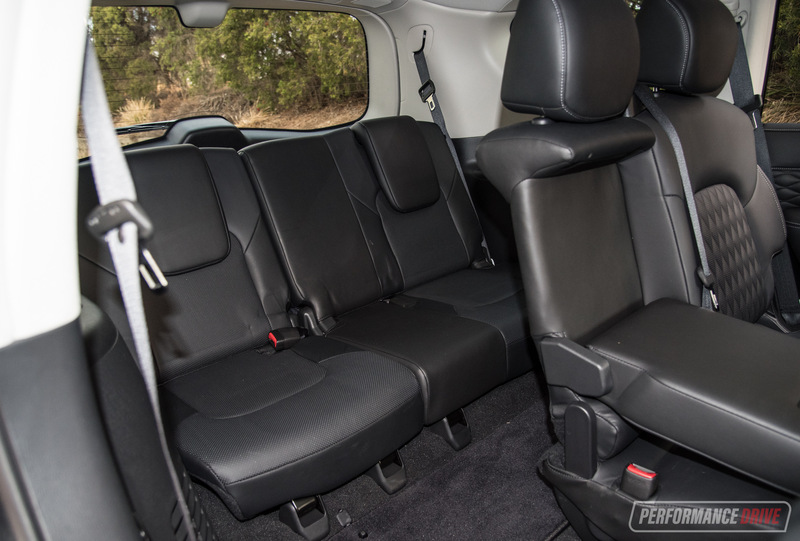 If you need more storage, the boot offers 470L of volume, and that’s with all seven seats in place. Fold the electric third row down and you get 1405L. We’ve tried to find the maximum volume stats with both rear rows folded flat but we can’t find the figure. We’d be guessing well over 2300L. 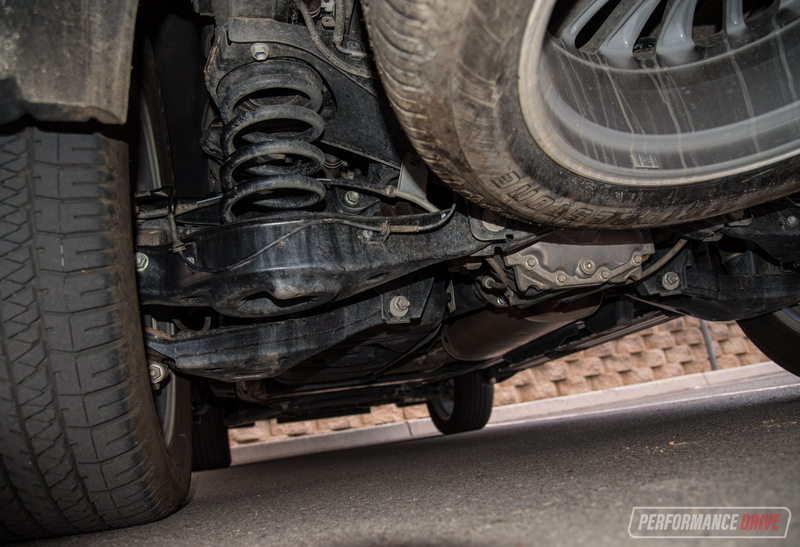 The standard alloy wheels are also a whopping 22 inches in diameter, and the ground clearance is rated at 246mm. As for the seating space. What can we say. It’s bloody huge in here. Adults will find comfort in the power-adjustable third row. Shoulder space is surprisingly wide and there are even cup holders right up the back. Two USB ports have been added to the middle row for 2018, and legroom in this row is ridiculous. We’d even go as far as saying it is one of the most comfortable second row seating spaces on the market. You’re up high, with a commanding look over other motorist. Pair that with the discreetly rumbling V8 up front, and it’s just so relaxing. 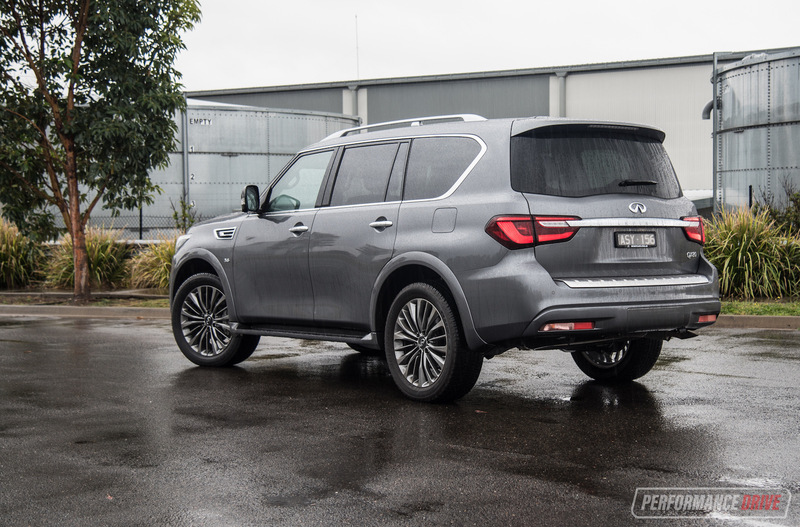 You probably think we’ve gone nuts by saying this, but the 5.6-litre V8 engine in the QX80 is one of the nicest motors we’ve experienced. No, it’s not an outright powerhouse that screams down the road in a cloud of tyre smoke. But as a mainstream motor, it is superb. You can hear it, but it’s not too loud. 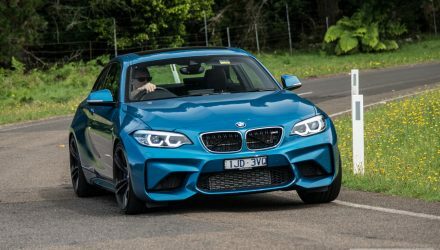 And you can definitely feel it, with its somewhat peaky 298kW available at 5800rpm. It loves to rev. But thanks to the 4×4 gearing, there is plenty of grunt low down in the rev range. It leaps off the line with no hesitation, clocking a best 0-100km/h time of 7.37 seconds during our testing. 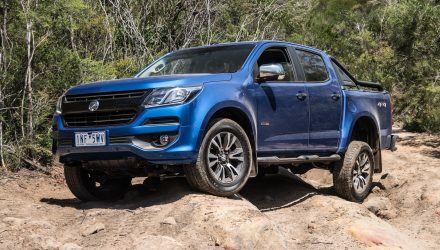 It is strange starting a drive impression for a heavy-duty 4×4 by talking about the engine. 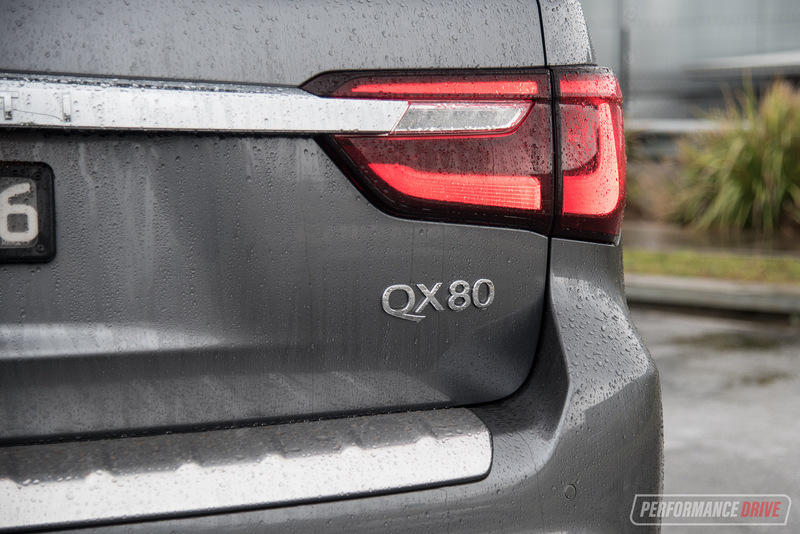 But if the QX80 featured a boring V6 diesel or even V6 petrol, it wouldn’t be half the vehicle it is. And you probably wouldn’t take it very seriously. There is a price to pay for this magnificent engine, as you probably predicted. 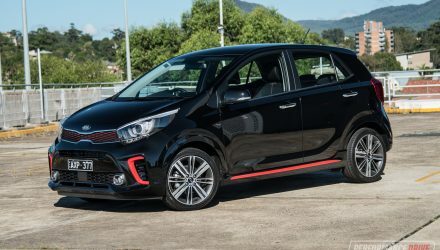 With a 100L fuel tank and a recommended fuel rating of 98 RON, don’t expect any change from a crisp $100 note every time you fill up (and that’s if you don’t let it go too low each time). Again though, we wouldn’t have it any other way. 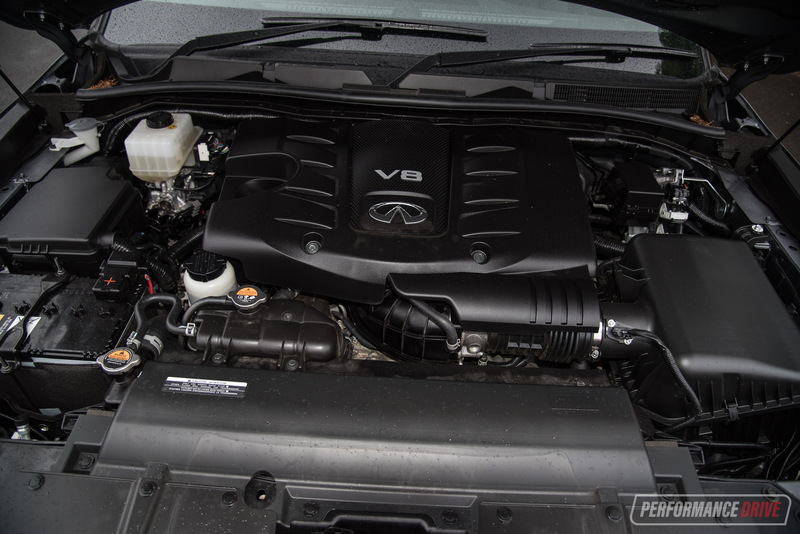 The QX80 needs this engine. Around the suburbs the QX80 is actually pretty easy to drive. It’s large, for sure, but it doesn’t take long to get used to it. 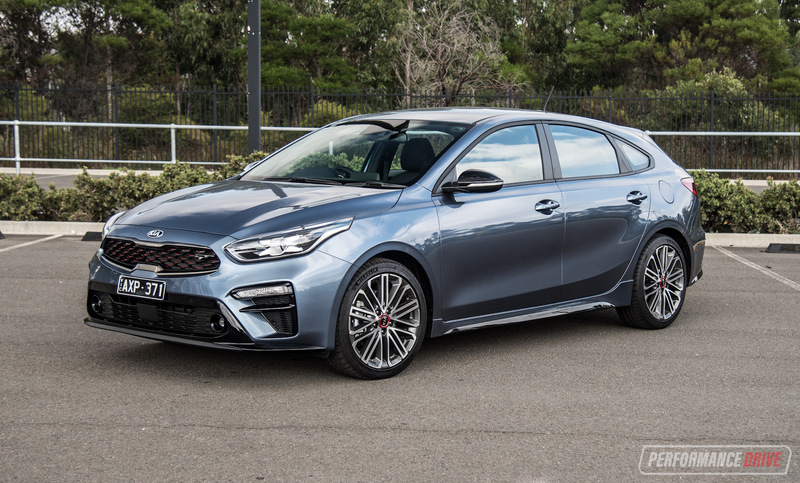 Placement in the lanes is made easy thanks to the light steering and planted nature of the suspension, and visibility is great. The handling isn’t too bad either. 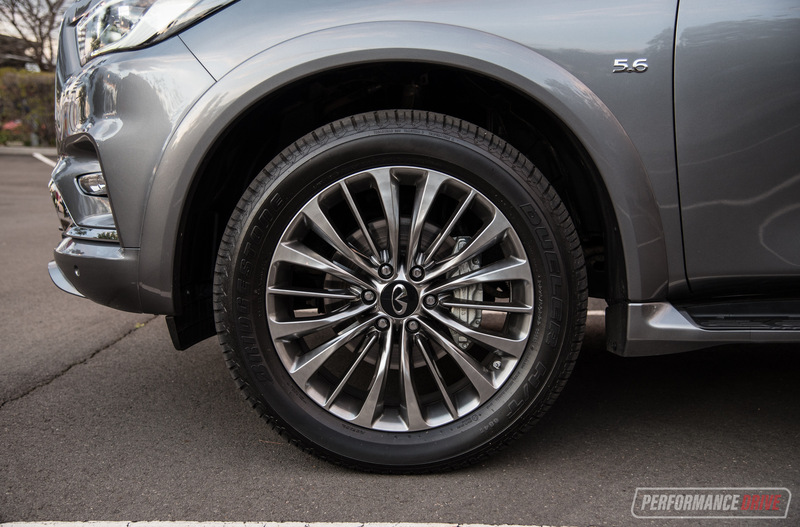 Featuring 22-inch wheels, the 275/50 tyres are suited to on-road use. The low-ish side profiles don’t give in, helping to suppress body wobble and excessive lean. Obviously, if you push it hard enough in the bends it will start to become unsettled and nervous. After all, it does weigh 2783kg. We’re talking acceptable levels though. 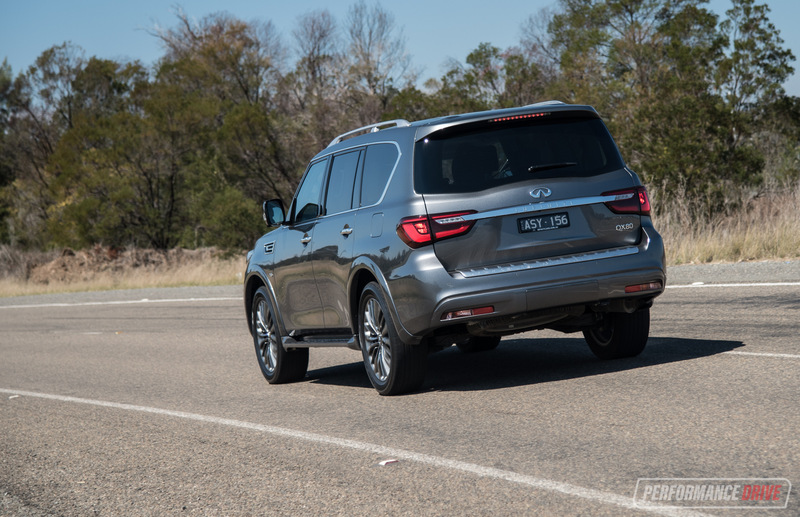 Let’s not forget it is based on the heavy-duty-focused Nissan Patrol. Part of the on-road competence comes from the fully independent suspension and Hydraulic Body Motion Control (HBMC) technology. 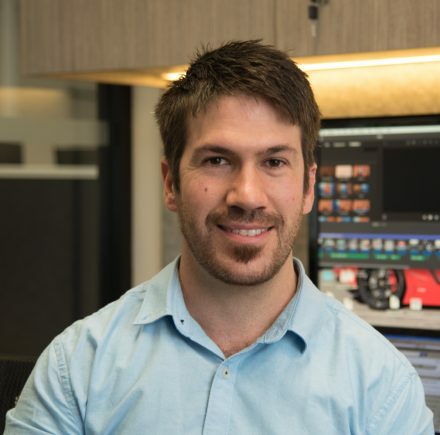 This technology is able to monitor body roll and lean when travelling around corners, and adjust special hydraulic cylinders that are mounted to each shock absorber to help counteract lean. When it comes time to head away from the beaten track, the QX80 is more than capable of fulfilling most family camping expeditions. 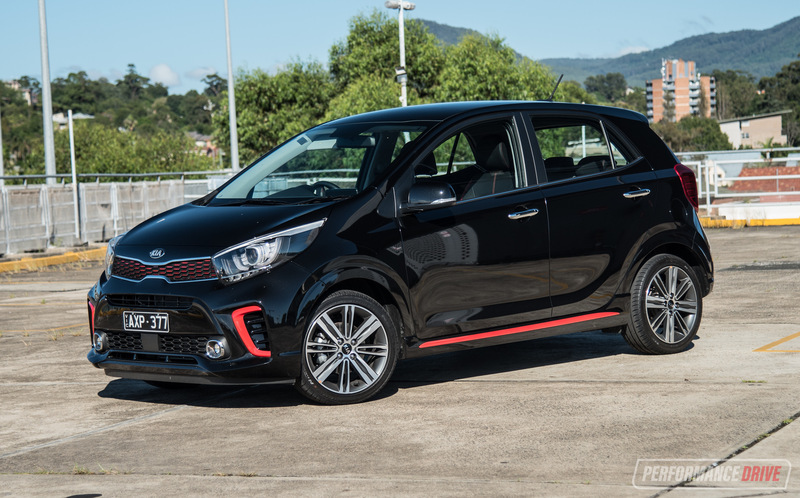 You can fiddle around with the on-board driving modes, and even engage low range and the rear differential lock for really tough conditions. 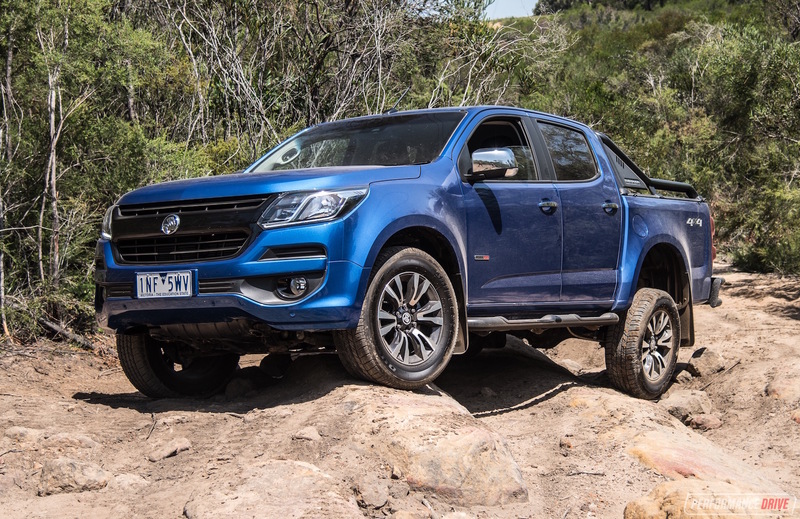 However, the low profile tyres do limit its outright off-road exploring potential. 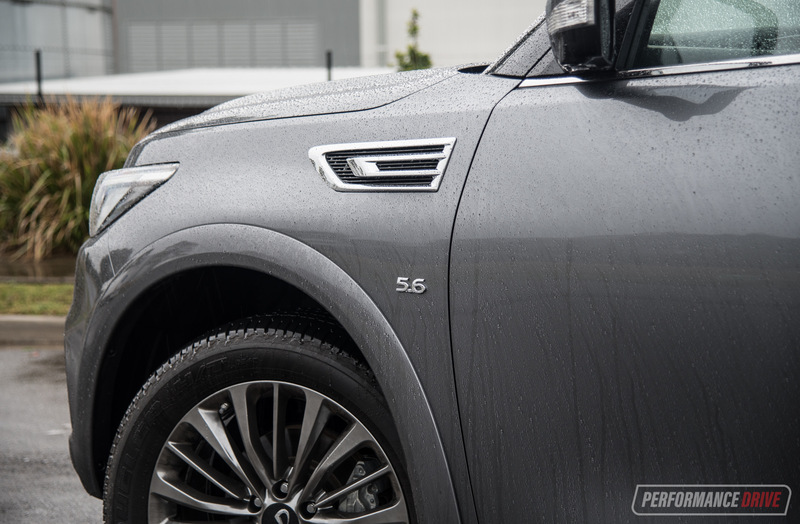 We reckon you’ll get further in the Lexus LX, especially as it comes with height adjustable suspension. 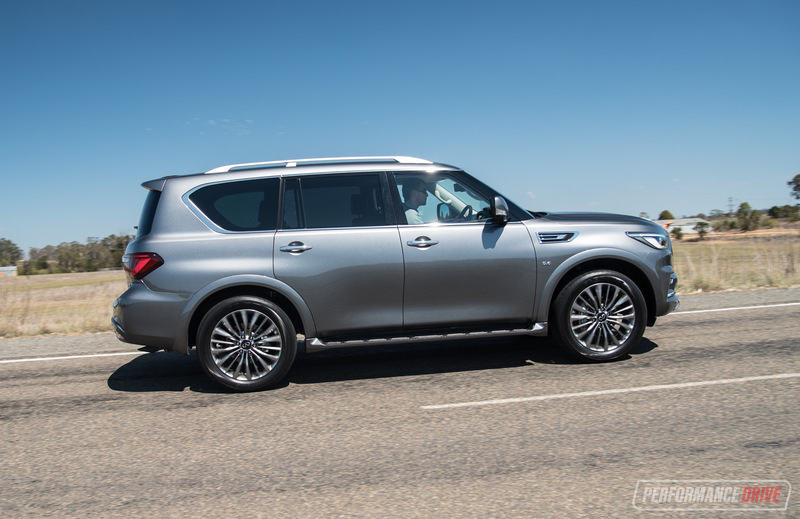 But in saying that, the QX80 is superior on the road. 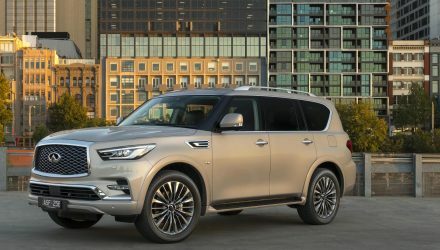 The QX80 is dated in some areas, but the freshened up exterior design does help it stand out among many modern rivals. We absolutely adore the V8 engine featured here, and think it’s what makes the QX80 such a heroic and confident drive out on the road. We also love the sheer size of the interior. 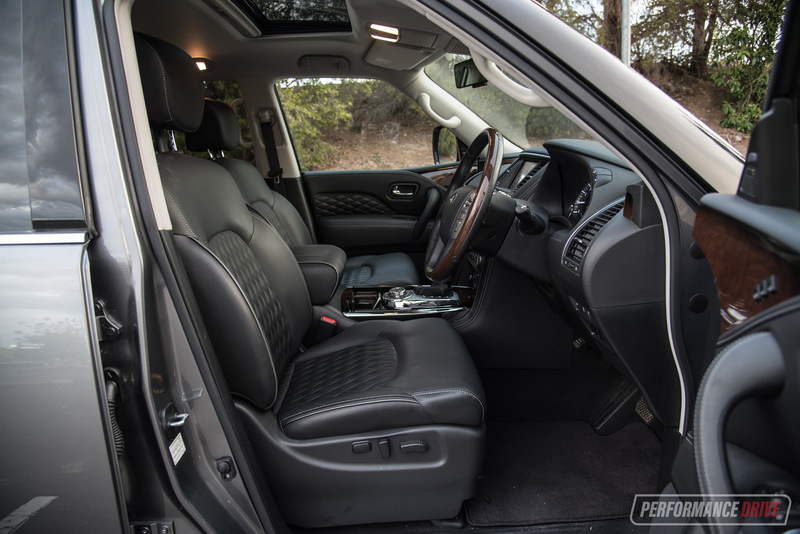 If you need a genuine 7-seat SUV that comfortably seats adults, and still offers a sizeable cargo area, you’ll be hard-pressed to find anything with more room this side of a bus.